— New powerful Text Viewer, which includes Harfbuzz for the interpretation of OpenType Layout features. It contains a nice three-state features selector (on / default / off). — Support for all the competing color OpenType font extensions: Microsoft’s ‘COLR’/‘CPAL’, Adobe’s ‘SVG’, Apple’s ‘sbix’, and Google’s ‘CBDT’/‘CBLC’. — Updated Side by Side Viewer, which contains among other new options, a ‘Winding ﬁll’ as opposed to the standard ﬁll option. 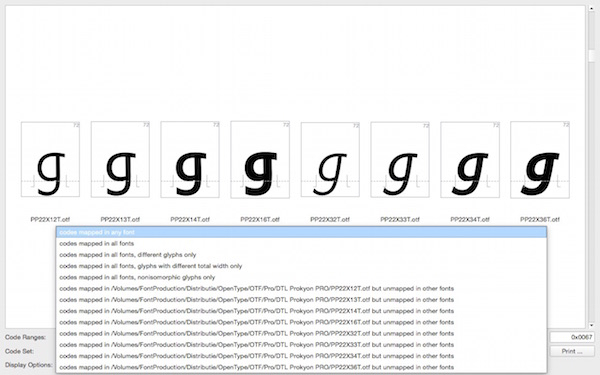 — Enhanced and now fully mature Glyph Editor (basically a compact version of DTL FontMaster), with improved guideline and grid functionality, improved measurement options, new clipboard with support for multiple entries, etcetera, etcetera. 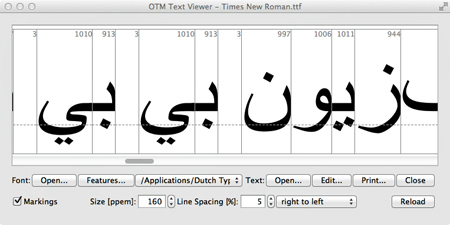 DTL OTMaster 5.0 is available for Mac OS X, Windows and Linux. Please note that because of the inclusion of Harfbuzz the lowest supported Mac OS X version is Lion (instead of Snow Leopard in case of version 3.7) now. From today on until the 6th of January 2015, OTM 5.0 can be purchased with a special 25% Christmas-holiday discount. Current 3.7 licensees are eligible for an upgrade against € 7.50 administration and handling costs. FontLab Ltd. customers can do this via FL Ltd.’s website and DTL customers can apply for this via DTL’s FontTools shop. Registered users owning any other previous versions can upgrade for € 50. 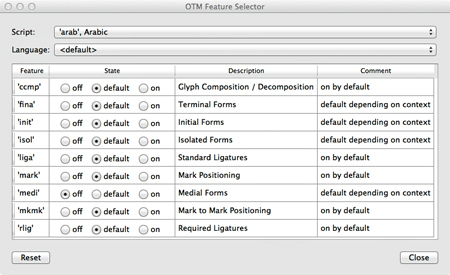 DTL OTMaster 5.0 can be purchased directly from FontLab Ltd. and DTL’s FontTools shop (web addresses are mentioned above). Great news! How can I upgrade as a current 3.7 licensee? Through http://www.fontmaster.nl/ or sending an email or...? Was there a version 4? Yes, and for instance also 3.9 and 4.6 during development. The versions that are eventually released (the previous ones were 2.4 and 3.7) always contain major new functionality. Those who purchased 3.7 (or earlier) from FontLab can upgrade from FontLab. 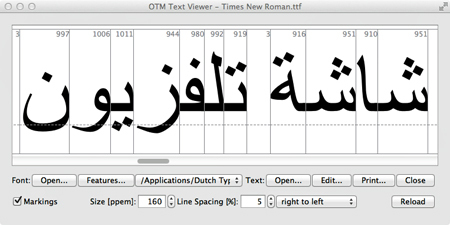 As far as I know, the Text Viewer in OTMaster 5 is the first GUI tool for Mac OS X that allows in-depth OpenType Layout features testing to a degree somewhat comparable with Microsoft VOLT on Windows — including complex scripts. 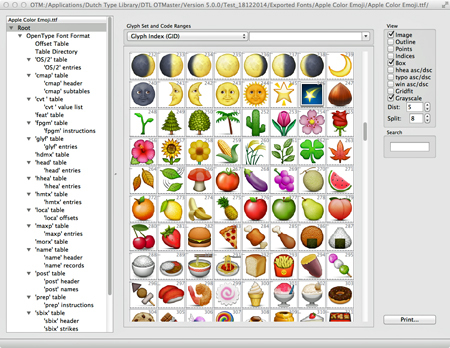 For example, Indic font developers can test both the "deva" and "dev2" branches of features. In the Text Viewer, you can choose the text direction, script and language, apply the default features for each script and selectively enable or disable each feature. You can show or hide the text boxes and glyph indices, and you can export the rendered image as PDF. The Text Viewer alone makes it worth the upgrade. Is the text viewer relevant for testing that features are coded correctly within the font (by using its own layout engine)? Or does it use the OS X layout engine so that we can test features as they will work across applications that use the OS X layout engine? It uses the opensource HarfBuzz engine, which currently has near-perfect compatibility with the reference implementations, i.e. Microsoft Uniscribe and DirectWrite. The OS X OpenType Layout engine (CoreText) is still miles behind, as are the Adobe OpenType Layout engines. In terms of Indic script support, the Apple CoreText engine support in Yosemite is pretty good, and in one important aspect just leapfrogged Uniscribe (as has the most recent Harfbuzz). From a proofing perspective, what VOLT does is a little different, in that it shows only what is happening at the lookup level, not interaction with shaping engines. So, for example, there is no reordering for Indic scripts. In order to mimic shaping engine behaviour in VOLT, you need to manually set the appropriate glyph order for the state you are testing. That's actually quite useful sometimes, when one needs to determine if a bug is in the shaping engine or the font lookups. Only six days left during which DTL OTMaster 5 is offered with a 25% discount. 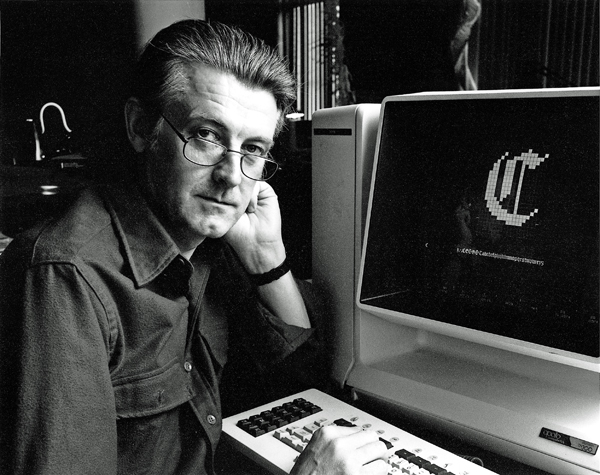 And then we will ofﬁcially start celebrating Dutch Type Library’s 25th anniversary by restoring OTM’s standard pricing (which is a bargain still). Karsten Lücke's nice manual for DTL OTMaster 5 is now available for downloading and as print-on-demand edition from Lulu Press Inc.
Frank, thanks for having Lulu printing available! 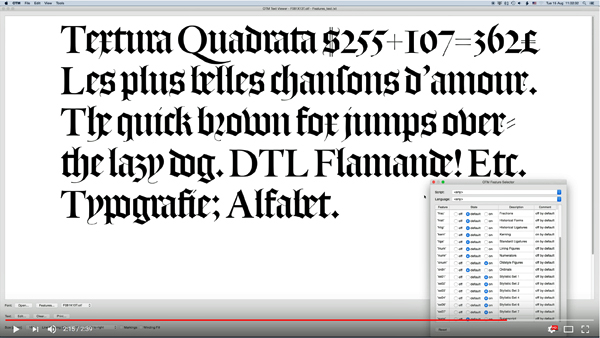 This short video on YouTube shows how I used DTL OTMaster to check the OpenType features of DTL Flamande. This typeface combines textura minuscules with roman capitals, besides Gothic majuscules. It was Plantin himself who combined Van den Keere’s ‘Grasses capitales de 3 regles mediane’ with the lowercase of the Canon Flamand in his Psalterium from 1571. The development of DTL Flamande started in 1992. That year Matthew Carter and yours truly were both speakers at the Didot seminar, which was organized by URW in Hamburg. During the event Matthew granted me the rights on his revival. Roughly 25 years later I invited German type designer Lukas Schneider, who holds a master’s degree from KABK’s TypeMedia and who successfully graduated at the Expert class Type design course in Antwerp, to enhance the character set. The full story can be read in the September 2017 edition of DTL’s NewsLetterNews. I might be a little bit biased, but I think OTMaster is a great tool. I am using it for quite a while now and I recently tested the most recent version, which has some nifty additions. I had to change Name Table entries (like here) for 28 fonts for example and it took me less than a minute. 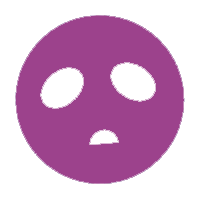 I really don't want to miss OTMaster in my tools palette anymore. Has DTL OTMaster 7 been released yet? I see in the caption for that YouTube video it says September 2017, but I couldn't find an update online anywhere. Will this be a free or paid update if coming from OTM 6? Has DTL OTMaster 7 been released yet? No. As always the planned development takes a little bit longer than expected. At the moment work is done to support CFF2 and then the manual has to be updated still. So, hopefully we will be able to release OTM 7 within a few months. We always charge €50 for updates. Actually this is absolutely completely peanuts considering the development costs. Any update on OTMaster 7 release date? Last month at the TYPO Labs 2018 conference Jürgen Willrodt and I demonstrated the latest beta version of OTM, including the CFF2 support. Work has almost completed and after adding a few improvements and removing some small bugs, OTM 8 (so, we will skip version 7, which was only used internally at URW and DTL) will be ready. Coming autumn OTM 8 will be released together with FoundryMaster 1.0. Thanks for the compliments! Next year we will celebrate OTM’s ten-years anniversary. Actually it took a while before the tool was commonly accepted, but today we have customers all over the world. More recently leading software companies started to use OTM on a more industrial scale: I am very happy to see this development, of course. OTM has a lot of hidden gems, for example the Side by Side Viewer. IMHO it is the Swiss knife for font development. 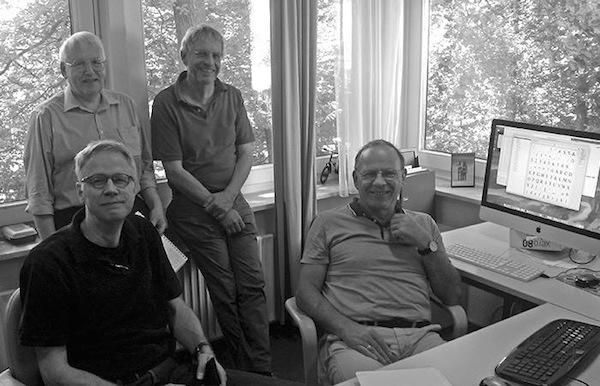 The people working on it (Dr. Jürgen Wilrodt, Axel Stoltenberg, Hartmut Schwarz, and yours truly) are all in the font (software) business for almost 40 years now. Together (since 1991!) we form one of the oldest teams in the type trade, I reckon.